The most successful eCommerce and retail businesses don’t optimize every metric available. They optimise the right metrics.. The most successful eCommerce and retail businesses are metrics obsessed. However, they don’t optimise every single metric available. Instead, they only optimise the right metrics. Today, we want to discuss one particular metric that is a hot topic in eCommerce right now, personalisation. In today’s digital day in age, customers literally have hundreds of choices when it comes to buying products. 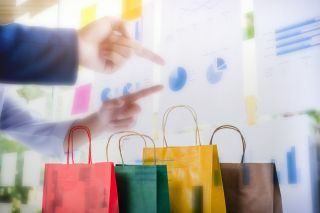 Nearly 50 per cent of consumers say they’ll spend more money with a brand that personalises their eCommerce experience. Personalisation in eCommerce can be defined as the proactive of creating personal interactions and experiences on e-commerce sites by showing content, media, or product recommendations based on the buyer’s behaviour, demographics… the list goes on. If you are reading this, there is no doubt you know what personalisation is, so we won’t go barking up that tree, however, many brands are still relying on basic forms of personalisation, and failing to engage consumers as a result. Some people assume we only talk about email when we speak about personalisation. But having your website content personalised too is a surefire way to success. Think about your homepage, product pages and checkout. Are they personally curated for every visitor? They should be tailored around their buying habits and increase conversion rates by giving an end-to-end personalised experience from email to check out. The list goes on… the key is to develop a best practice. Increasing your conversions means you must always have two primary goals in mind. Every product recommendation should provide two options. One is to have a call to action, this could be a ‘Where to Buy’ button, a ‘Click to Cart’ option etc. The second is a recommendation that will keep the customer engaged if they do not purchase, in the hope they purchase further down the line. Most brands don’t utilise this metric enough when it comes to personalisation. On average, 7 out of 10 shopping carts are abandoned for retailers, meaning, a lot of lost opportunities! Consumers don’t complete their transactions for numerous reasons, such as high extra costs, forced account creation and long/complicated checkout processes. But, don’t fret. This is not always bad, depending on the reason for checkout. It’s important to understand why they are not checking out in order to rectify the situation. So how can you engage a customer with an abandoned cart? Email Recovery Campaign. It’s absolutely critical to understand that email re-marketing is one of the most effective practices to get customers to return to your site, in hope to convince them to complete their original purchase. But, just like in any email campaign, you need to consider the content, timing, and yep, you guessed it: Personalisation! The folks at LUSH use quirky subject lines and emails with additional product suggestions to entice the consumer to come back to the store page. A good personalisation engine can turn your abandonment cart rate into positive conversions to influence the bottom line. As a shopper, wouldn’t you like to see a personalised email reminding you of what you considered purchasing in the first place, and why? Returning customers are critical to any stores success. Not only does a third of overall money spend online come from returning customers, but they spend nearly 3 times more than one-time shoppers. “Continue watching” is one of the most powerful features Netflix created. When we saw that, we realised it could be applied to eCommerce sites too. And BOOM, this is how continuous shopping recommendations were born. Unless you have been living under a rock, you know what Netflix is. Instead of manually searching and scanning through videos, you can pick up right where you left off. Similarly, this can be applied to an eCommerce site. Saving your visitors previous sessions makes it a hell of a lot easier for them to pick up where they left up. This is one of the most valuable tactics to date! Ultimately, experiences lead to better relationships with customers, enhancing your customer lifetime value. CLV is one of the most important metrics companies seem to be ignoring, Yet, marketers have been talking about how important knowing CLV is for years! A 2018 UK study found that only 34 per cent of marketers they surveyed were“completely aware of the term and its connotations”. By measuring customer lifetime value in relation to the cost of customer acquisition (CAC), companies can see how long it takes to recoup the investment required to earn a new customer. How exactly do you measure it? Add together over the lifetime of that customer. It’s clear that a whole range of factors impacts the CLV. But one thing that holds them all together is a great personalised experience. If you can ensure your customers experience a great experience the moment they land on your site to the moment they receive your product to their door, you stand a very good chance of ticking all the CLV boxes. Personalisation has boundless capabilities for your brand and customers. The results you can gain from implementing a personalised journey for your consumer, and more importantly, being able to measure its effect, could completely revolutionise your brand.